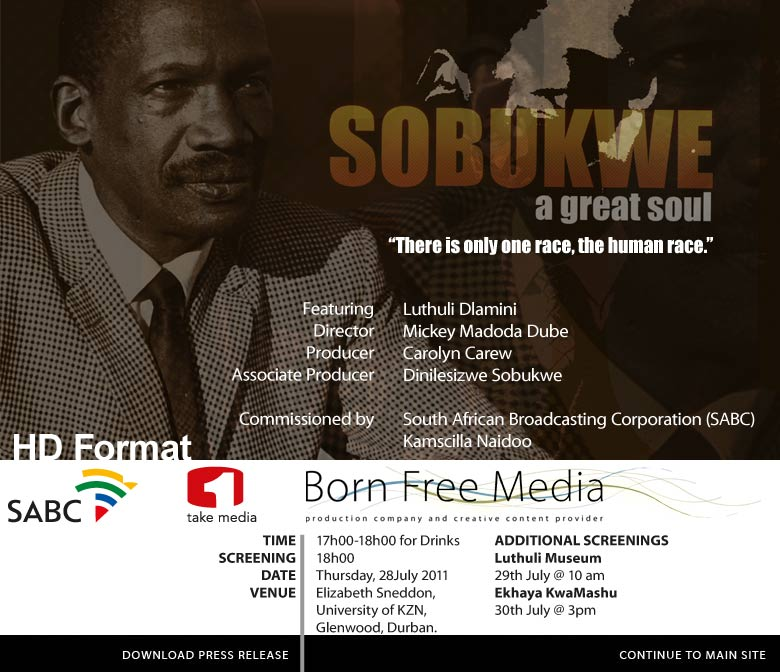 The story of the life of a remarkable man who helped to inspire and liberate a nation will be seen for the first time at the world premier of Sobukwe – a Great Soul, which showcased at the 32nd Durban International Film Festival on 28th July 2011. The film, directed by Mickey Madoda Dube, celebrates the life of Robert Mangaliso Sobukwe, restoring him to his rightful place as a leading figure in South African history. The film was premiered at the Durban International Film Festival on 28 July 2011 and received the Amnesty International Human Rights Award for “The best film with a focus on Human Rights”. Sobukwe – A Great Soul succeeds in finally breaking the mystifying silence that has surrounded Sobukwe’s extraordinary contribution, not only to reshaping South Africa, but also shaping the thinking of many across the African continent and the diaspora. Produced by Born Free Media & 1TakeMedia in association with the SABC and the Sobukwe Family Trust, the film is a feature length drama-documentary (as opposed to the traditional docudrama genre) which charts the course of a leader who has been all but forgotten in the anals of history. The documentary, commissioned by SABC’s Kamscilla Naidoo as part of their Icons series on South African leaders, explores Sobukwe’s life and provides a platform for his voice to be heard decades after he made his mark, putting his name back on the world map of great liberators. Sobukwe’s was a life of firsts, as the film highlights. His decisive action on 21 March, 1960 resulted in the historic day now known as “Sharpeville Day”, and lit the first fire that eventually led to the final demise of apartheid. Sobukwe’s actions paved the way for Steve Biko, and guided him to another historic moment on 16 June, 1976. He gave Pan Africanism new life, refining the ethos, taking it to the street and making it a common feature of the struggle in South Africa, laying the ground for the path to Black Consciousness. Sobukwe became an international icon whose passing led to a special session at the UN, such was his stature. He was considered prisoner number 1 on Robben Island, and earned the distinction of being the only man kept in solitary confinement for six solid years. The apartheid government not only feared his influence on other prisoners, so keeping him apart, but also created a special statute, a law that became known as the Sobukwe Clause, to keep him in prison and to keep his ideas from the rest of the world. Sobukwe – A Great Soul, featuring Luthuli Dlamini in the title role, communicates many of the qualities that Sobukwe embodied, demonstrating the integrity, courage, honesty, humanity and true leadership for which he was known, and which continue to have resonance today. Ultimately, the film aims to emphasise the loss of a great soul to humanity in Sobukwe. Born Free Media, with its talent for telling distinctly African stories, is well-placed to relate his story. Mickey Madoda Dube, Director/Producer of 1TakeMedia, is an international award winning Film, TV and Commercials Director. His filmography spans both the social and the political. His first film, Imbazo, about state-sponsored violence in SA, won countless awards globally. One of Mickey’s proud works is a documentary for UNICEF called Through The Eyes Of The Child. It looked at the plight of SA children at the turn of the century. Mickey co-created and co-conceptualized the Pan African reality series, Imagine Afrika (part of the ‘You’ campaign), which aimed to inspire young Africans to become change agents in their communities. Mickey has also written and directed a number of television drama series, notably, the controversial Umthunzi Wentaba (Mountain Shadow), which explored the death of boys in SA circumcision schools. The show led to the establishment of certain laws and procedures to prevent these deaths. Born Free Media is a South African film and television production company specialising in fiction and non-fiction storytelling. Launched in 2005 by multi-award winning executive producer, Carolyn Carew, and joined in 2009 by creative director, Khalo Matabane, and Line Producer Tsholo Mashile, Born Free Media has made its mark on the local and international television and film-making scene. Their acclaimed series “When We Were Black”, produced by Carew and directed by Matabane, earned 7 drama awards at the South African Film and TV Awards, as well as two international awards for best drama series. Their company produces TV dramas, documentaries, reality TV and youth shows across the African Continent. The film will be screened at the Tri Continental Film Festival in Johannesburg during September 2011 and will be screened on SABC 1 during March 2012.